There are several reasons why we believe that having a good mandoline slicer in your kitchen is essential for exquisite meals but there are 2 should convince almost everyone. First off, you need to make sure that whatever pieces of food you are cooking are of equal size, otherwise, the smaller pieces will get burned and dry up while the larger pieces will remain uncooked. Advanced chefs usually take pride in their ability to portion everything just with the use of their knives, but, if you are cooking some French fries, or you need perfect slices for a ratatouille, why mock about with a knife when a mandoline slicer will do the job just as well? And the second reason is safety. 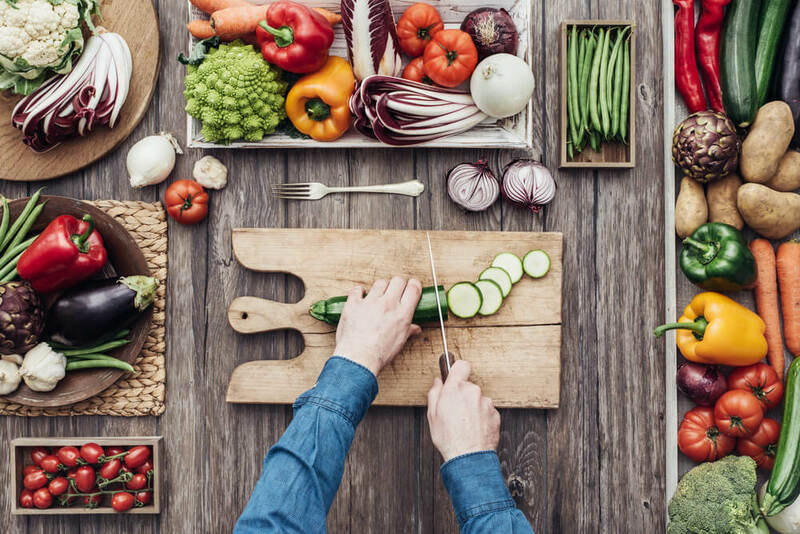 We would not suggest that a chef would ever cut into his own fingers, no matter how big of a rush he was in, but for a regular cook, that is a definite possibility. So we decided to look at many of the mandoline slicers on the market judging them on how safe they appear to be, but also on how much faster and easier than can make the cooking process. We have to admit that the Paderno World Cuisine A4982799 Tri-Blade Plastic Spiral Vegetable Slicer is a bit of an odd bowl in the world of mandoline slicers but we had to give it some points on the fact that it uses such an original design. 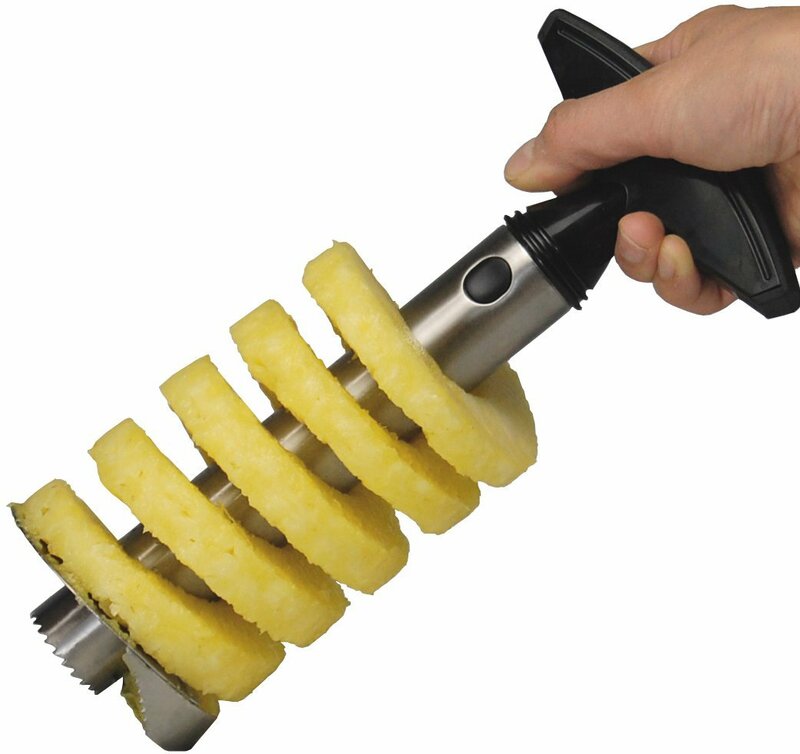 In this case the grip with the vegetable stays in one place, while you are rotating it, and you are meant to push the blade towards it. This has the added benefit that you will be able to stop the cutting process much faster if some sort of accident should happen. There is also the added benefit that, by cutting in a circular movement, you can easily create long strands of various vegetables. 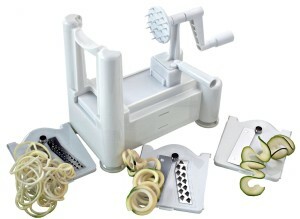 In our book that means this is the best mandoline slicers for vegans as there are loads of recipes that require you to create a sort of spaghetti from cucumber or zucchini. And we are not the only ones excited about this product: almost 4,000 customers have awarded it an average 4.5 star rating on Amazon, which considering just how many people actually contributed, is a massive score. As great as we might think the spiral vegetable slicer may be, we are certain that there will be those among you who still prefer to go with the classical. 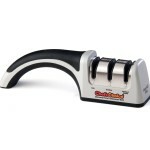 Of all the mandoline slicers we have tried we would have to say that the Swissmar Borner V-1001 is the very best. Everything starts from surgical grade stainless steel blades that do actually make light work out of any potato, and can even slice a full ripe tomato into perfectly beautiful slices. The plastic frame is made from sturdy ABS plastic and it is wide enough to handle any type of vegetable with ease. In order to change the blade all you have to do is pull out from the plastic side of the tray so your fingers are perfectly safe at all times. 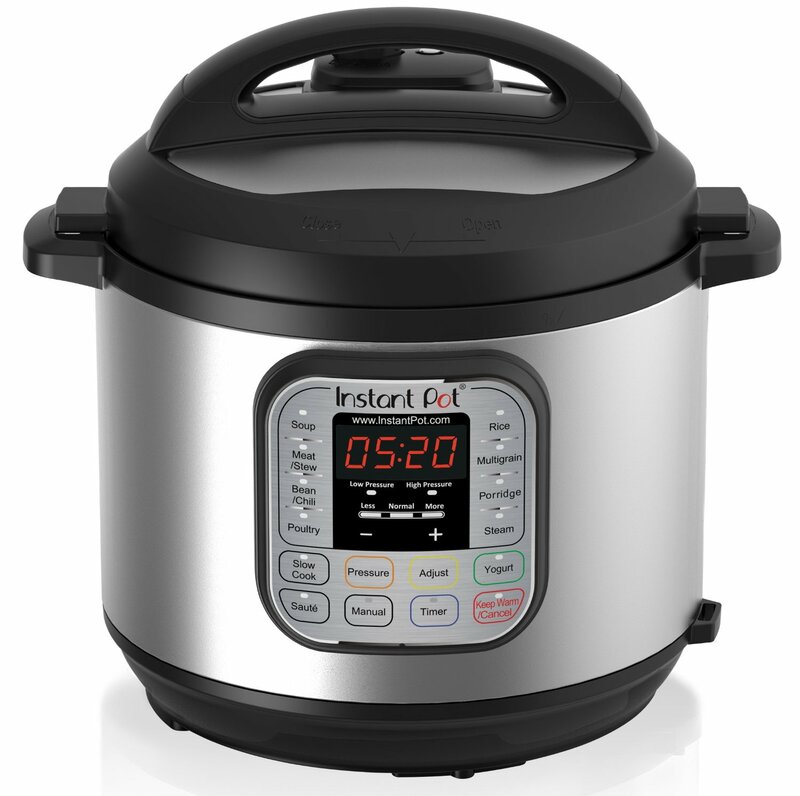 And the grip feels sturdy and safe and has the added advantage of working perfectly for both left handed and right handed cooks. Finally, we have to admire the fact that the entire vegetable holder can be packed and stored away with the greatest of ease. 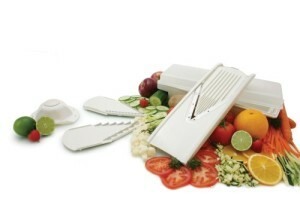 The Benriner Japanese Mandoline Slicer is the best recommendation we could make to those of you who enjoy Asian foods. It is not just the name that makes the connection between this mandoline slicer and Oriental cooking, but the blades themselves are designed for that type of cooking. The straight blade can be set to cut very thin slices of vegetables, perfect for Sushi, or can be switched up to create thicker pieces. 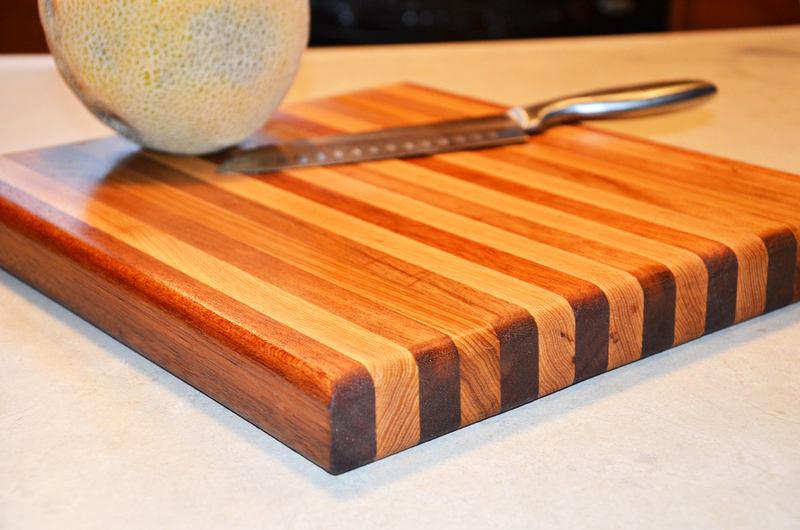 The other blades are perfect for cutting the vegetables for a delicious stir fry recipe. The blades for every Benriner Japanese Mandoline Slicer are made in Japan, and we could see and feel the extraordinary quality of the workmanship that went into designing this slicer. 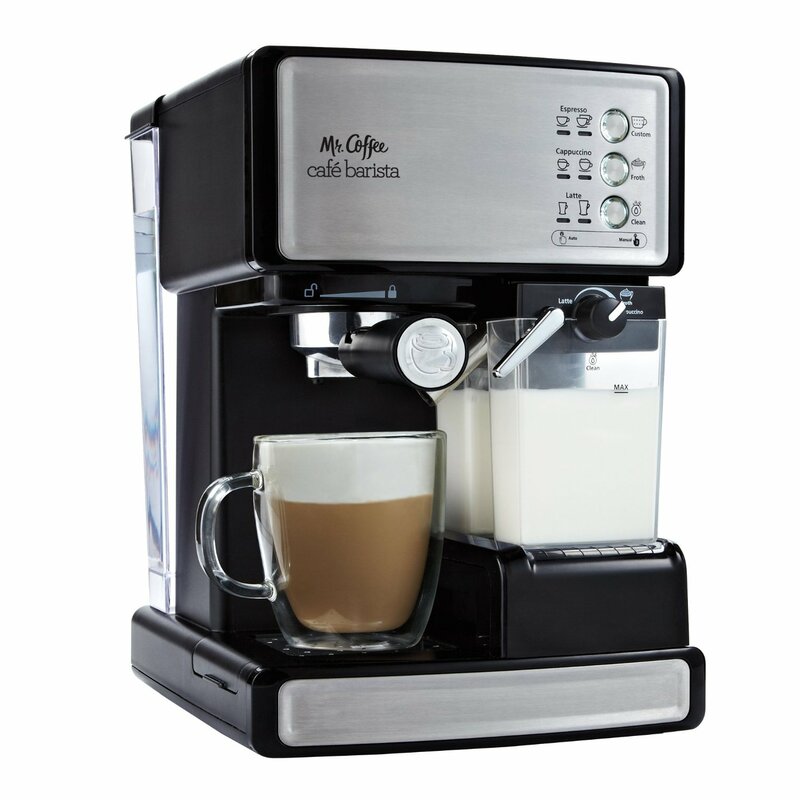 And the fact that it was awarded a 4.3 star rating on Amazon from nearly 400 customers, should tell you just how good the Benriner really is. We have already talked about a Swissmar Borner mandoline slicer and we really thing that one makes the most sense in terms of what this gadget does and the money you are paying for it. 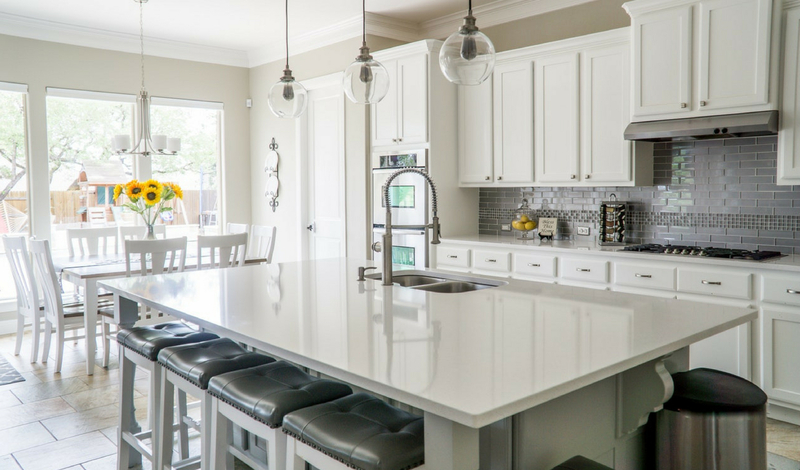 However, we all know that you need to really enjoy your kitchen and the idea of cooking in order to create extraordinary delicious foods. 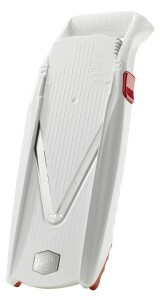 So we decided to introduce to you a second Swissmar Borner product, the V Power Mandoline. It costs only $10 more, but it will upgrade the look of your kitchen from grandma’s house, to a Star Trek kitchen. The V Power works just as well as the V-1001, and it can be stored away just as easily, but when you look at it you cannot help but think that this was a machine designed with a purpose. The only problem with the classical mandoline slicers we have introduced so far is the fact that you need to be able to hold them up with one hand while slicing with the other. That may not be a problem for some of you, but everyone will agree that the simple solution provided by the Prepworks From Progressive Folding Mandoline Slicer, which is to have a folding grip that can double as a support. 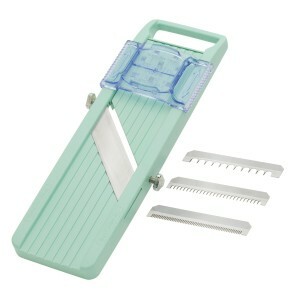 So if you get tired of holding the mandoline slicer, you can set it down and keep on slicing. It is quite a good slicer, but we did feel that we needed to put a little bit more power into the cutting process than with the Swissmar Borner slicers. 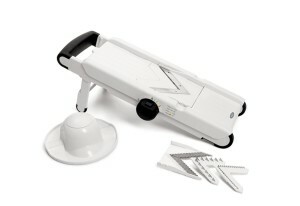 Staying with the hands free theme set by the Preworks mandoline slicer, we have the Oxo Good Grips product. Although it is designed primarily as a handheld device, it has some very useful grooves on the bottom that allow you to suspend it over a bowl or something similar. Changing the blades is as simple as depressing a trip button, pulling out the old blade and inserting a new one. And the finger guard is large and strong enough, that you would find it very difficult to cut your fingers even if you wanted to. 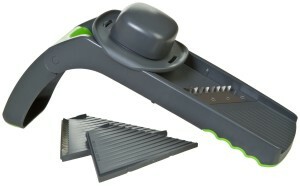 The interesting thing about the mandoline slicer market is that, once a company comes up with a good idea, everyone else will try to get the same effect with a different technology. The answer Swissmarr Borner came up with to the Oxo mandoline slicer is the V-Prep that comes with its own multifunction bowl. 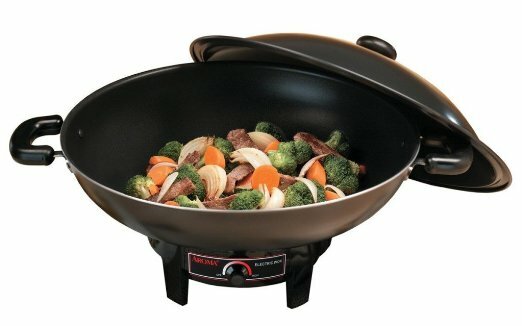 The Swissmar Borner V-Prep Mandoline fits perfectly on top of the bowl, and the bowl has grip fit on the bottom, thus freeing up one of your hands. The good thing is that, for the money, you can get a perfectly good bowl and a new functionality. The disadvantage is that, if you lose or damage the bowl, the V-Prep will not fit on top of any other bowl. 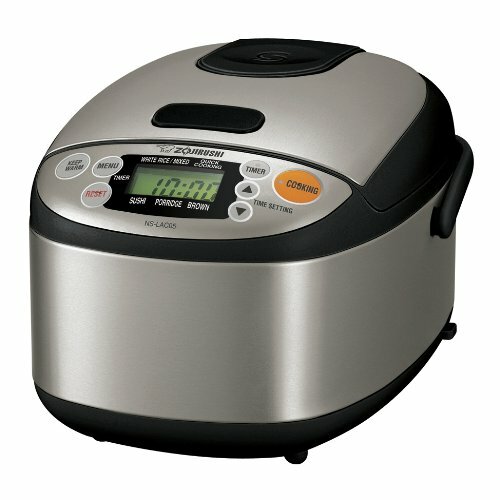 On the other hand though, the V-Prep itself is a better, easier to use slicer than the Oxo so it is probably worth taking good care of that bowl. 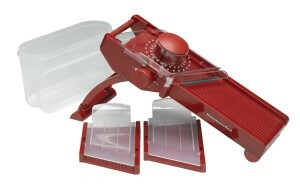 At a glance the Kitchenaid Classic Mandoline Slicer is a perfectly decent tool, and we would have to admit that we would not sneer at anyone sporting it in their kitchen. However, the reason why we placed it so far down our list is that the manufacturing process was clearly not perfectly followed through. You can see the seam line and the entire thing seems to be quite flimsy. 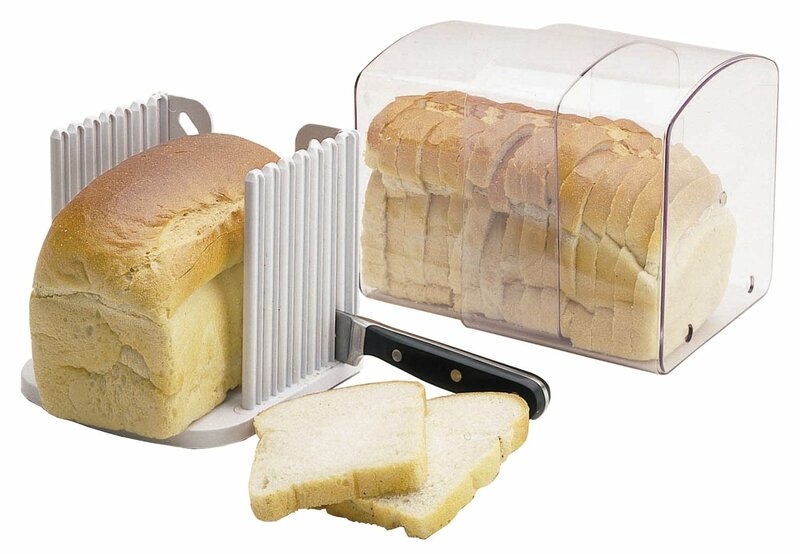 On a more objective test, though, it held up to every type of vegetable we could through at it so we decided you could do far worse than the Kitchenaid Classic Mandoline Slicer. As previously stated, when someone comes up with a good idea, everybody else will try to follow. In case you did not realize before, the advantage of using a v-blade is that it will come at the vegetable from 2 directions in a scissor like action that will allow you to cut better. The masters at this type of a mandoline slicer are still the guys from Swissmar Borner, but Oxo did a pretty good job with their slicer too. And they also included that grip that you can use to rest down the slicer, to rest one hand, or to use both hands with a particular difficult cut. The only real problem we have with the Oxo v-blade mandoline slicer is that it is not quite as wide as we would like and, as a result, you might find yourself wrestling to cut some of the bigger potatoes into French fries. 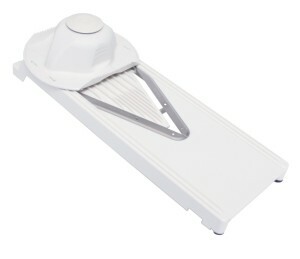 Our final product in our war for the best mandoline slicer is the Norpro Mandoline Slicer Grater. As a slicer it is, by far, not the best we have tried, simply because it is very narrow, and you may even have problems slicing some big tomatoes. 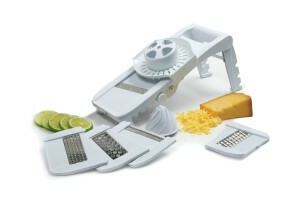 However, the reason why we absolutely had to feature it here is because it also doubles as an excellent kitchen grater. 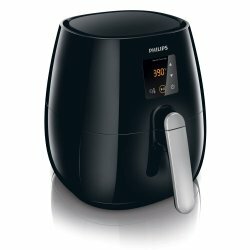 For us that is the very definition of a kitchen gadget, and we can only hope that the second version will be a bit wider and maybe come with some Benriner blades.